The Data Protection Act was set up to do exactly as it says on the tin - protect consumers’ data. This means that there are some things that your business must do to ensure you’re compliant with the recommendations. The Act says that your company must create and store its data in a secure environment and that all data must be disposed of in a secure manner. In the case of paper, shredding is the best method to dispose of your paper waste. For branded documentation and IT equipment, a more permanent destruction method is required to shred the hard disk or branded item to avoid fraud. 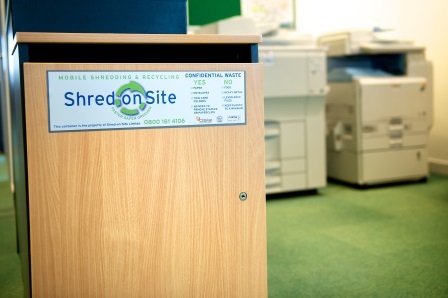 Shred-on-Site are document shredding specialists that focus on keeping your company compliant with current legislation whilst being environmentally friendly. Our secure paper shredding solutions are designed to be cost effective whilst reducing your carbon footprint.